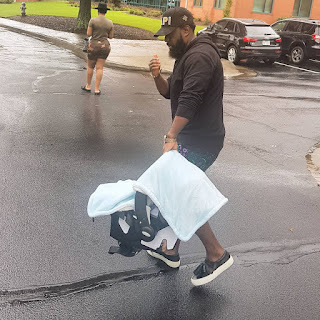 Photo :Timaya steps out with new born son. The singer who welcomed a son with his new partner a few weeks ago stepped out with him his car seat saying he stopped by in the US to see his son before going back on tour.. This would be Timaya's third child as he has 2 kids from his previous relationship. #BBNaija star CeeC sizzles in denim..
#BBNaija's Cee-c in beautiful new photos..
#BBNaija's Leo steps out rocking all pink look! Adorable new photo of #TrueThompson..
Davido's Boo Chef Chioma in Lovely new photos..
Photo;Toke Makinwa shows off new look hips! Dakore Akande dazzles in white..
#NickiMinaj is coverstar for Vogue Arabia..
#SerenaWilliams is coverstar for Time! Queen of Soul #ArethaFranklin dead at 76! Music star #Ashanti dazzles in metallic dress! #Bobrisky dazzles in new makeup photos.. Brand new video: Davido - Nwa Baby! BBC News Pidgin launches first essay competition! #BBNaija's princess stuns in velvet! #Nollywood's Aneke twins in lovely new photos..
#BBNaija's Ceec in beautiful shoot..
#BBNaija star Bambam's dazzling all white look..
Adorable photo of #KevinHart and his sons! #BBNaija's Bisola AIyeola dazzles in Ankara..